I have to say this is an incredible disc. Back in 1997, Steve Perone sent me two seven inch releases. They were intriguing enough to invite Planet Seven into the Pit. ON the heels of the show came an excellent show they did for us in Appreciation Hall, and a fine first CD Pleasure Craft Recovery Theme. their featured on KFJC's Waves of the West CD. 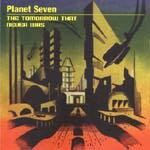 I loved the blend of surf and space rock via the Theramin and Hawkwind/punk crunch rhythms. then, along comes this long overdue second CD. It is astoundingly good! The ever changing ominous scenery and liquid green feel are very magnetic. Excellent melodies and crunchy structures. At the top of the must-have list is the stunning Hawkwind surf treatment of Johnny Barakat and the Vestells' "Long Ride." Truly inspired! Long liquid whammy chords tell a forbidding story of danger while tribal drums grumble. "Point and Shoot" is melodic and ominous, and very cool, with slithery surf and dangerous undertow. An excellent track! Sludging the lumbering lounge with surf and gloomy groove, "Jack Scratch" sports a fine blend of thick and delicate, of surf and waterfront mob action. The distortion guitar drives the nerves as the keys haunt the halls. The Yardbirds' "Heart Full Of Soul" is a surprise choice and with a bit of jazzy guitar and delicate fuzz, it takes on a new edge. Great percussion and guitar work drive a very respectful redeployment of Graham Gouldman's classic song. Johnny Barakat and the Vestells' "Long Ride" is completely reinvented. Ominous and huge, it takes on the air of a Hawkwind classic driven for the waves. This is amazing! Completely wonderful, utterly magnetic, and optimistically dark. Great surf guitar and theremin, and tuff space rock effects, which add up to an amazing arrangement. Wow!!! Dark thrash and chunk, haunting surf guitar, dangerous rhythms, all contrast against each other to provide a unique and powerful journey. Punky and surfy and dark sea green. On the edge of an abyss, the surf guitar and grumbling danger cohabit a dark corner of space. Rhythmic and fluid, "A Great Divide" tells the tale of remorse over the distance between. Melodic and enticing. Sparkling and exotic, whammified and structured around pleasant chords, this melodic tune welcomes you to a new day, to a new beginning born of the sadness of your past. The reverbed trumpet cries its grief notes. Very emotional and effective. The Raybeats' "Guitar Beat" gets spaced out, chunked up, slowed down, and dangerized to the max. Thick and crunchy, and flowing with dark charm. Celebrating the most futile of all house hold activities, "Let's Dust" is a super chunk extravaganza of surf and space crunch, with theremin wails and gloomy surf guitar. Threatening, in an inviting way. Punky, chunky, dark, and edgy, with liquid whammy and fuzz rhythm. This perhaps is the archetype for the band's sound, with a precision confrontation between surf and fuzz and space, between peace and war. Very good track! "16mm" is soft and filmy, lumbering moodiness, and strange around the edges. Very aquatic in a calm before the storm kinda way. Sad and almost mourning a great loss while looking at the relentlessly renewing dark green sea.